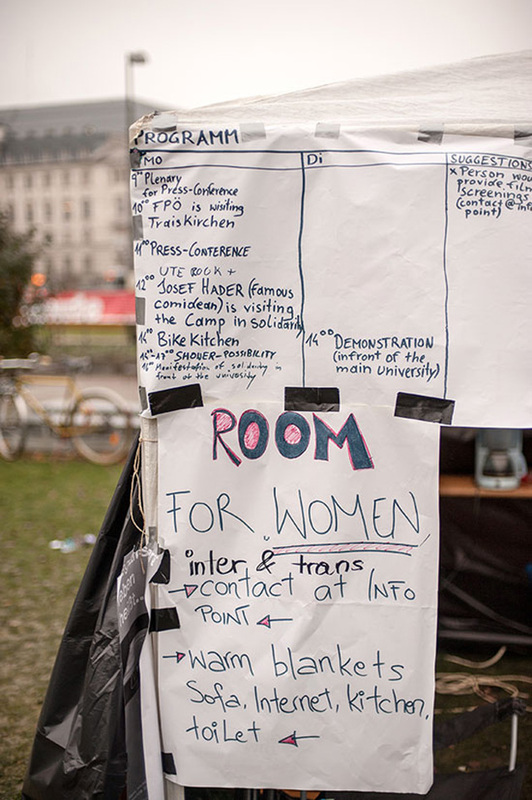 The Refugee Protest Camp in Vienna was supported by multiple NGOs and many activists and students, including a number from the Academy of Fine Arts in Vienna. The hunger strike ended after a month (in January 2013) and the archbishop himself promised the refugees that they could remain in the church and would not be expelled by police. On February 1, 2013, after a break of ten days, the refugees in the Votive Church announced the resumption of their hunger strike, since the government had made no effort to meet their demands to find a solution regarding their legal status. On February 5, one of the hunger strikers was deported to Hungary. Presumably, he will be expelled from the European Union, or worse, deported back to Pakistan. On February 16, around 2,500 people in Vienna and other EU cities marched in solidarity with the refugees, a day after the refugees decided to stop their hunger strike for a second time in order to consider their next move. 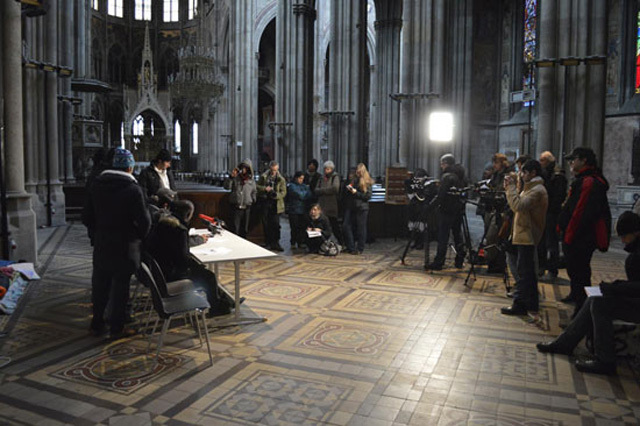 In the beginning of March 2013, the protesting refugees agreed to move the Refugee Protest Camp Vienna into a former monastery that was offered to them by the Austrian cardinal Schönborn. In the monastery they are offered legal counsel and legal representation—a “safe space” for continuing their struggle to change the asylum system. At the present moment, the historic self-organized movement of refugees in Vienna and throughout Europe is constantly changing, as the refugees are hostages of the European “sovereign” states and the fortress of EU policies. What is becoming clear is, to use Achille Mbembe words, that Europe’s “good conscience … has wanted to be responsible for nothing, guilty of nothing.”2 The international human rights regime that was developed in Western Europe after World War II and that has spread globally has reached a dead end. It must be rethought and radically changed—politically, economically, and ideologically—to keep refugees from being left at the mercy of a regime of imprisonment, exclusion, marginalization, and death. The intention of this text is to open up a discussion about solutions and to rethink the frame within which the self-organized movement of refugees takes place. The fact is that the movement and the demands put forward by the refugees are of historic importance. For the first time, refugees have self-organized themselves and have started a public discussion on the subject of asylum and human rights. This has resulted in the formation of a political platform with demands to change the situation of refugees in Austria and in the EU as a whole. 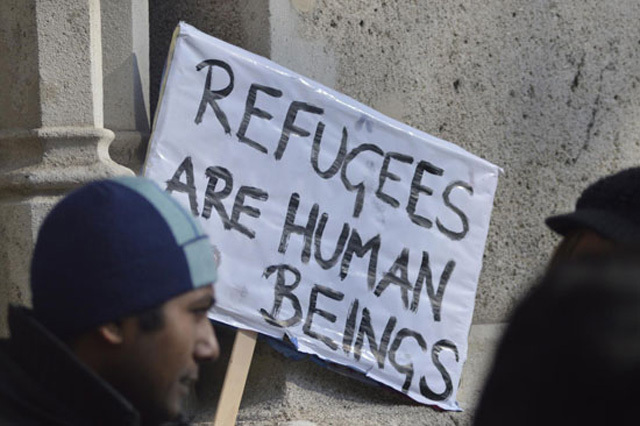 In March 2012, in Würzburg, Germany, refugees started a struggle to obtain the most elementary human rights.3Since May 2012, refugee strikes have occurred in Denmark, Turkey, Bulgaria, Greece, France, the Netherlands, and Austria. The protests in Germany, the Netherlands, and Austria formed, in effect, a platform of united forces. A Refugee Congress is planned for March 2013 in Munich, Germany, where participants will discuss future actions, organizational bodies, and a list of political demands that will aim to change the awful conditions for refugees and asylum seekers in the EU and Europe. 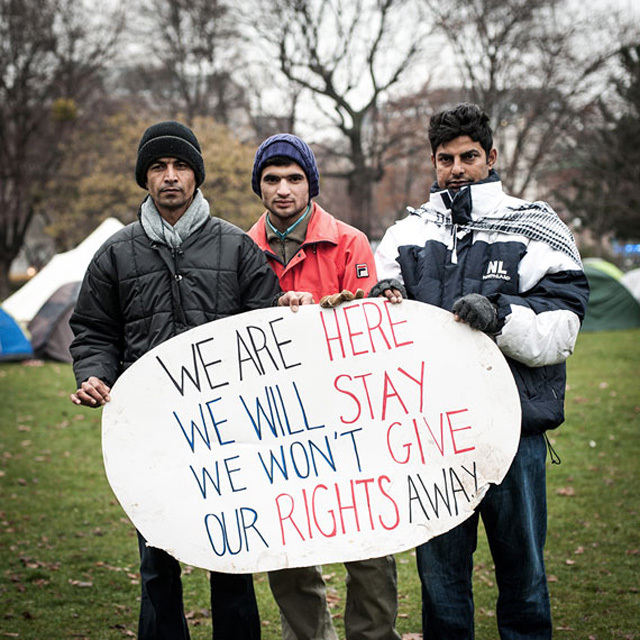 The demands of the refugees of the Refugee Protest Camp in Vienna are twofold. One part regards better living conditions, from adequate food to a decent social life. (The refugees are completely isolated in refugee centers that prevent them from having a social life, from participating in the wider social and political life of Austria). They want the chance to learn German and to have professional translators who will accurately translate their demands when they are caught in the limbo of state bureaucracy and are interrogated by the repressive state apparatus. The other part of their demands is the most important: the right to stay and the right to work. They want to exercise self-sufficiency and not be the object of charity from the state or any NGO. For at least a decade, the refugees have been caught in a situation of systematic abandonment. Their living conditions in the EU have gradually deteriorated. This process was neglected by the nation-states in the “former” Western European countries. For a long time the refugees have been systematically forced into a situation of impoverishment, deprivation, and seclusion. They have been the victims of a process of racial discrimination that has diminished and depoliticized the concept and the status of human rights. Poster in refugee protest camp, November, 2012. Photo: Andreas Edler. The refugees decided themselves to break out of such a situation. They started not only by making demands, but also by performing and acting out political equality in the space of the EU’s pre-established political, social, and economic inequality. The EU survives on a constant reproduction of inequality, which is the axiom of neoliberal global capitalism. The refugees broke the predetermined space of politics in which only predetermined actors—let’s say citizens—have visibility and are taken seriously when asking for democratic rights. But the struggles and demands of the refugees—who, in the parlance of Jacques Rancière, belong to the “part-of-no-part” in the present global capitalist political reality—imposed themselves in a way that forced the people of Europe to regard them as equal.4 In so doing, they re-politicized and rearticulated the space of Europe, imposing the axiom of equality in a space of political, social, and economic inequality. The refugees did not ask for “some” rights that would only allow them to enter and maybe participate in the space of politics and the social. They were not captive to an old modernist idea of politics, waiting for their place in the political arena, for a place reserved only for those already considered to belong to the political space—for example, nation-state citizens with their form of good life (a “good” life that deteriorates for them too in times of crisis). Instead, the refugees appropriated the space that was seen as inaccessible to them. They thereby changed the coordinates of the established and safeguarded notion of in/equality. They actually subverted the whole space of traditional politics. Their self-empowered action came as a surprise, and it opened up the possibility of demanding changes to the laws of EU nation-states. Moreover, their actions will force the NGOs and activists that support them to reorganize themselves and their struggle. This political platform emerged forcefully when the refugees symbolically rejected the Ute Bock Prize for Moral Courage, which was given to them in January 2013 in Vienna. On the one hand, the refugees thanked the organizers of the Ute Bock Prize for awarding it to them, but on the other hand, they asserted that they did not need charity, but political and economic (human) rights—namely, to stay and to work! Hence, the refugees repoliticized the space of the political not by simply asking to be included, but by appropriating the space. They showed that both politics and the “human” in “human rights” are outcomes of a process of reconfiguration and repoliticization, as described by Rancière. They opened up the possibility for equality in a situation of tightly controlled and constantly reproduced inequality. The actions of the refugees show that there are not two types of human beings, citizens and non-citizens. Either we are all citizens or we are all non-citizens! This conclusion came to the fore in a public talk by one of the refugees from the Refugee Protest Camp in Vienna. He implored the Austrian public: “You are citizens that support our demands. Therefore, why don’t you demand that your political representatives—who you, as citizens, have elected—change this unbearable situation? !” The response was complete silence. The refugees’ demands pose a set of questions and problems that target not only the biopolitical regimes of the “former” Western European countries of the EU, but the whole Western concept of human rights as it was developed after WWII. Until the fall of the Berlin Wall in 1989, human rights and asylum politics were predominantly used to reproduce the division between Eastern and Western Europe. 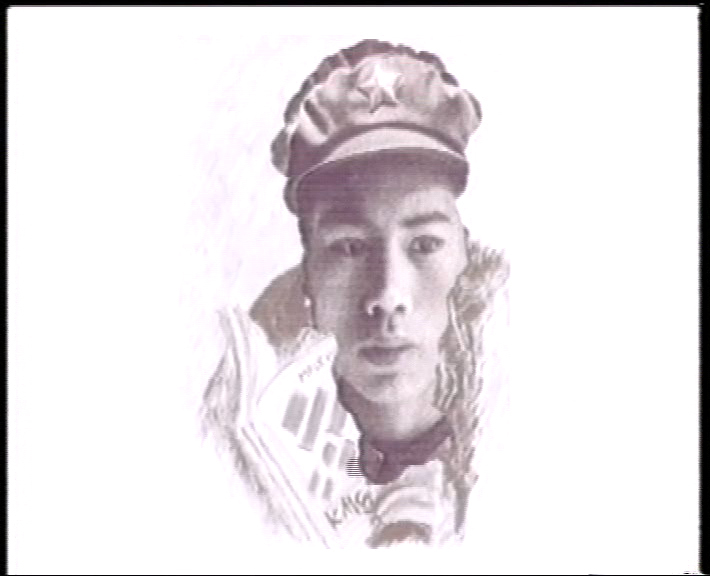 The East was presented as a totalitarian realm, while the West was a place of democracy and respect for human rights. Human rights policy has been one of the main shields used by democratic capitalist regimes in the West to deflect discussions regarding the fascist reality of Western Europe after WWII. The question of human rights started to visibly disintegrate after the fall of the Berlin Wall. After 1989, the emergence of global capitalism caused refugee and asylum policy in Europe to deteriorate. It is said that the employment restrictions imposed in the EU today are meant to protect the citizens of the EU, especially in Western Europe, so their living standards do not decline. We are well-aware that wages have remained stagnant for a decade. Protests in the public spaces of European democracy are frequently suppressed by police and military forces (authorized by laws that originated in colonial times, as is the case in France).5 In the biopolitics of the West, citizens are strongly differentiated in terms of class, gender, and race—differentiations, discriminations, and exploitations that multiply globally. This is not just a question of “diversity,” as it is constantly presented to the public. On the contrary, the former proletariat has changed into a precariat, and increasingly sees itself as “the wretched of the earth.” The perspective of the world seen from the side of the colonized, as formulated in Frantz Fanon’s famous work written during the Algerian anti-colonial struggle of the 1960s, shows that EU biopolitics are constantly reproduced by and through necropolitics. Let’s look into a genealogy of this process of producing massive racial subsidies, and the brutal racialization of the social, political, cultural, and economic space of the European Union after 1989.8 After the fall of the Berlin Wall, it was deemed obsolete to speak of any type of East/West division. But gradually the “outside” binary was transformed into an internal process of divisions, fragmentations, classifications, and discrimination based on race, class, and gender. Before, we had two regimes—socialism and capitalism—with myriad constellations between them; today we have one system that produces a steady fragmentation of many key historical concepts. If previously there was talk about life and death, today we have a differentiation within each category itself. 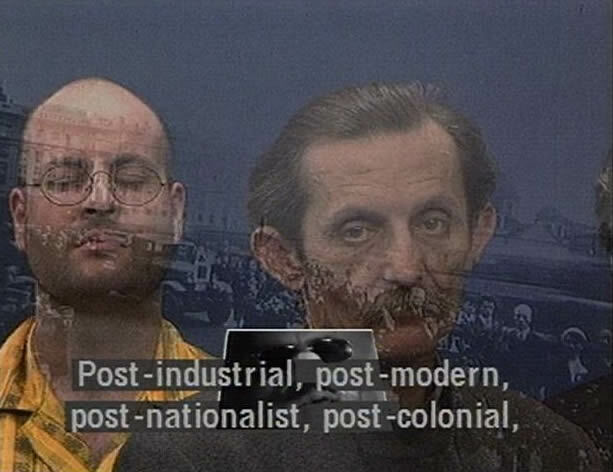 The major break happened in the 1990s when Giorgio Agamben made a conceptual distinction within the category of life: a distinction between “form-of-life” and “bare life.” (This break coincided with the post-Cold War “disappearing” of borders.) Agamben neglected to extend his analysis to death. This only happened in the work of Achille Mbembe when he coined the term “necropolitics” in 2003. February 21, 2013. Photo: Daniel Hrncir. The list of capitalism’s victims is divided from within. Some victims have a higher status, while others are unimportant. Through this process, the capitalist Christian project of dispossession does not allow any “identity” to acquire a position from which to denote capitalism as such. These identities are pitted against each other, without understanding that they are a product of the processes of racialization, presented in the capitalist system as a kind of identity politics. The promise of liberation by capital is therefore a paradoxical and cynical measure in which liberation is presented as an infinity of fragmentations. At work here is the process of capitalism’s racialization, a control axis on which endlessly differential forms of capitalist expansion are being conceived. Structural racism is the core logic of global capitalism. Racialization is its internal administrative, judicial, and economic procedure, which regulates the space of financial capitalism as well as the system of representation, theory, and discursivity. Racism is not just an identity politics but something internal to the whole agenda of the transformation of the nation-state under global capitalism. It is possible to argue that in the passage from nation-state to war-state, which is the contemporary form of the old imperial nation-states of the past, we bump into a specific formation: the racial-state. All EU states are racial-states, as demonstrated by the way they have managed refugee and asylum politics. This is to say that what supports the process of identity politics is not simply a multicultural project of differentiation in society, but a process of racialization that is actually at the core of contemporary global capitalist societies. The identity politics that we have defined as the product of a process of multiculturalization in contemporary capitalist societies is in fact a process of racialization. 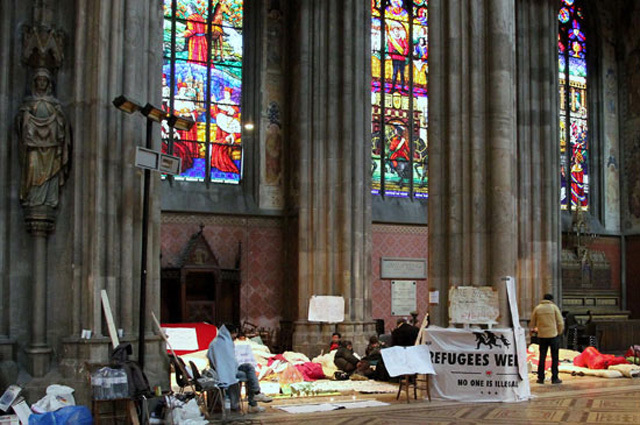 Refugees camped inside Votive church, Austria. Copyright: Bwag/Wikicommons. At the same time, homogeneous control structures stay in the hands of those who have “defined” the purposes of capitalist public space, i.e., first-world capitalist centers of colonialism. They have created the pretense that the homogeneous center allows unprecedented liberty for heterogeneous difference, as long as these differentiations do not become political! On the other hand, structural racism and processes of racialization are hidden in global capitalism, which asks us not to talk about racism. Contemporary capitalism denies racism, claiming that it belongs to the era of colonialism, before the global world we live in today. Or more precisely, talking about racism is prohibited as a normative demand, while racialization still remains the main logic of differentiation in the social, political, and economic spaces of global capitalism. The notion of powerless existence in the context of racialization and representation, theory and discursitvity, should not be treated in binary terms that would imply the existence of a relation of dichotomy between the (powerless) subjugated and the (death bringing) subjugator. The “guise of arbitrariness” should be seen as the capacity for hegemonic power to give death at any time, while the powerless existence should not be seen as an a priori position, but as a property that has marked the closing of the distance between the subjugator and the subjugated, neutralizing antagonism between the paradigmatic protagonists in the cosmology of power. It is precisely this arbitrariness that is employed in the processes of (out)sourcing, deporting, and devising that are part of a refugee center’s procedures when granting or rejecting papers to stay, work, or live. In a way, arbitrariness makes a coherent connection between racialization and the system that sustains it. Press conference at Votive church, February 5, 2013. Photo: Daniel Hrncir. It is also important to expose the fact that the process of racialization at work in the refugee and asylum centers, and in the whole system of refugee policy in Europe, allows for a brutally perverse structure of racialization. Racialization provides a kind of “internal clock” or a “set of guidelines” used by capitalist white racist ideology, that can be seen as well as the embodiment of a prohibition organized on the basis of “smashing of all prohibitions,” but only when presented as the regime’s ability to posit itself “antagonistically” toward its own racist ideology. For instance, political parties in power in the EU claim that they would like to do something about the situation, that is not at all “a case” of discriminatory policy, but simply an effect of laws and regulations that unfortunately take time to be changed. This arbitrariness, as Achille Mbembe argues, “accomplishes its own work and validates itself through its own sovereignty, and thereby permits power to be exercised as a right to kill.”10 Therefore, arbitrariness does not function as a mask for the absence of some profound “possibility.” Nor is it a “new form” of capitalism based on mandatory transgression. Rather, arbitrariness is a symptom of an ideology based on utter emptiness—or more precisely, based on an emptiness that is being filled by transgression. The capitalist necropolitical horizon (the one that produces a pure abandonment of life and at the same time the activation of the war machine) takes racism as “legitimizing” terrain for it’s processes of discrimination and dispossession, presenting racism and racialization as a sort of “benign” modernist (we could almost say atavistic) process of infinite narrations. These narrations are presented as a pure irregularity (and not a systematic process), hence, as an “erratic” framework that fosters struggles for the prominence of identity, culture, and race within the hierarchies of exploitation. 2 Achille Mbembe, Sortir de la grande nuit. Essai sur l’Afrique décolonisée [We must get out of the great night: Essay on decolonized Africa] (Paris: Découverte, 2010), 171. 3 This began when refugees pitched a small tent in Würzburg. It has since grown into a huge movement that has spread all over Europe. See→. 4 Jacques Rancière, “Who is the Subject of the Rights of Man?” South Atlantic Quarterly Vol. 103, No. 2/3, (2004) 297–310. 5 In her text “French Suburbia 2005: The Return of the Political Unrecognized,” Rada Iveković writes: “When the [French] government reactivated the law about the state of emergency [in 2005], passed during the Algerian war in 1955, the French learned that colonial legislation had never been abrogated in the first place.” Rada Iveković, “French Suburbia 2005,” in New Feminism: Worlds of Feminism, Queer and networking Conditions, ed. M. Gržinić and R. Reitsamer, Vienna: Löcker, 2008. 6 Suvendrini Perera, “What is a Camp…?”, e-borderlands Vol. 1, No. 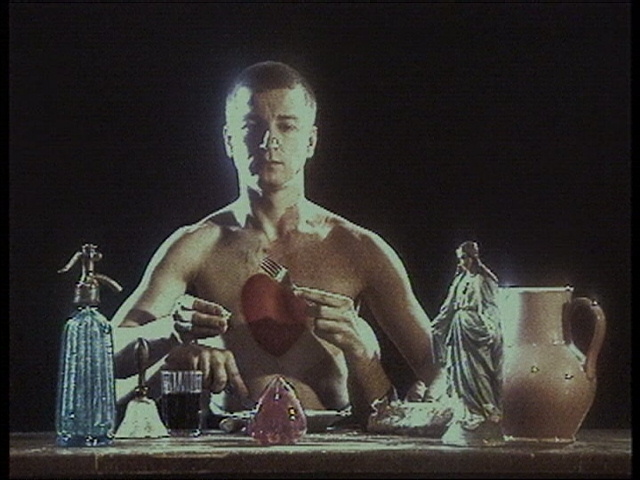 1 (2002). See →. 7 Achille Mbembe, “Theory from the Antipodes: Notes on Jean & John Comaroffs’ TFS,” in Theorizing the Contemporary (2012). 8 See my research conducted with Šefik Tatlić: Marina Gržinić and Šefik Tatlić, “Global Capitalism’s Racializations,” 2011, →. In the following, I will reuse parts of this research. 9 Achille Mbembe, On the Postcolony (Berkley and Los Angeles: University of California Press, 2001), 13.